“I’ve come to wive it wealthily in Padua” was how Cole Porter wrote it for the score of “Kiss me Kate”. Actually in the three days we spent walking through this town, we only saw one small reference to Shakespeare’s “Taming of the Shrew”. I guess the Padovans feel their own history is a more interesting than the version of an English playwright who probably never set foot near the Veneto. There are some remains of the old Roman city here but most of what we see is from the 13th century on up. 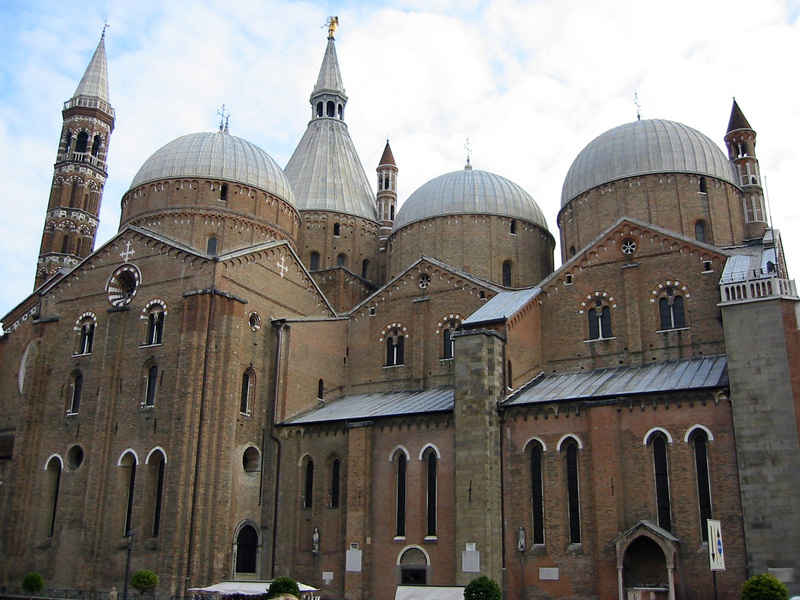 The University of Padua was founded in 1222. It’s the second oldest University (next to Bologna) in the world. Like Bologna, Padova is a University town, but where the streets of Bologna are entertained with punk haired, pierced, guitar strumming buskers, Padova’s streets echo with the music of jazz saxophone duets. It all seems a bit more polished here, from the grand venetian squares, the exotic Byzantine domes of the Basillica di Sant’ Antonio, to the grand cafes and the galleried University theatres were the likes of Fallopio and Gallileo used to lecture. The 12th century Palazzo del Ragione (Town Hall) is fabulous. We heard it was the largest column supported roof in Europe. You can walk in and out of the building and through the cavernous meeting halls and from the top, there are some spectacular views of the city. 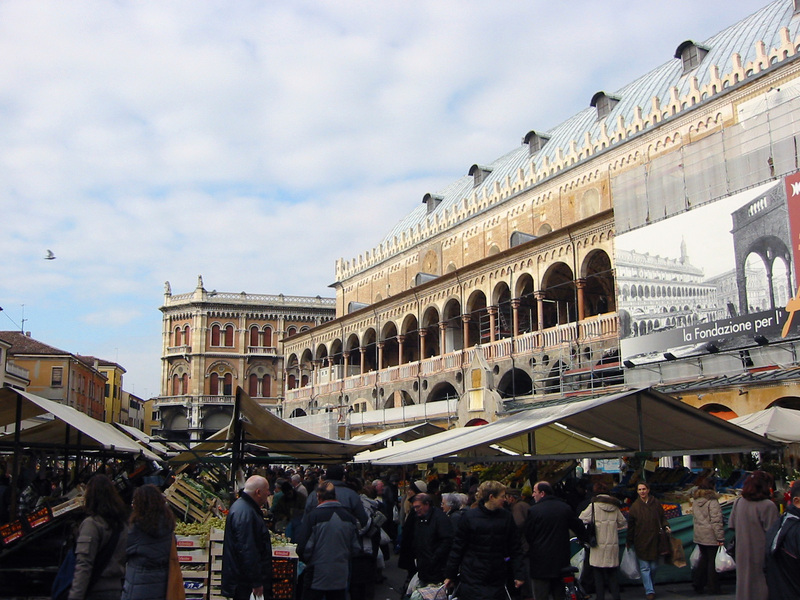 It also presents a great backdrop for the weekly markets in the square (see photo above). The markets go from fruit and vegetable to meat and fish to clothing to hardware and to art. It’s an all day affair. Before the roads were built, the preferred travel route between Venice and Padua (the two main cities of the Veneto) was by water. You can still travel the Brenta River from Venice, passing along a lot of beautiful Venetian estates along the way. 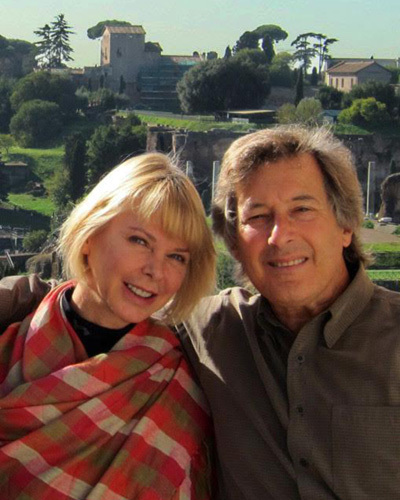 It’s also an easy day trip from the Venice bus station in Piazzale Roma. We came to Padua by car but we plan on a trip along the Brenta River soon.Although the canals do run through the center of Padua, the city isn’t closed off to traffic like Venice. The street signs arte a bit challenging but you can take a car to most locations here. Old town of old Padua is one of the most beautiful in the Veneto, if not in all of Italy. Among the recent renovations to the city is the Prato della Valle, a large city square once used for horse racing inside of the city walls. According to the Padovans, it’s the largest square in Italy. 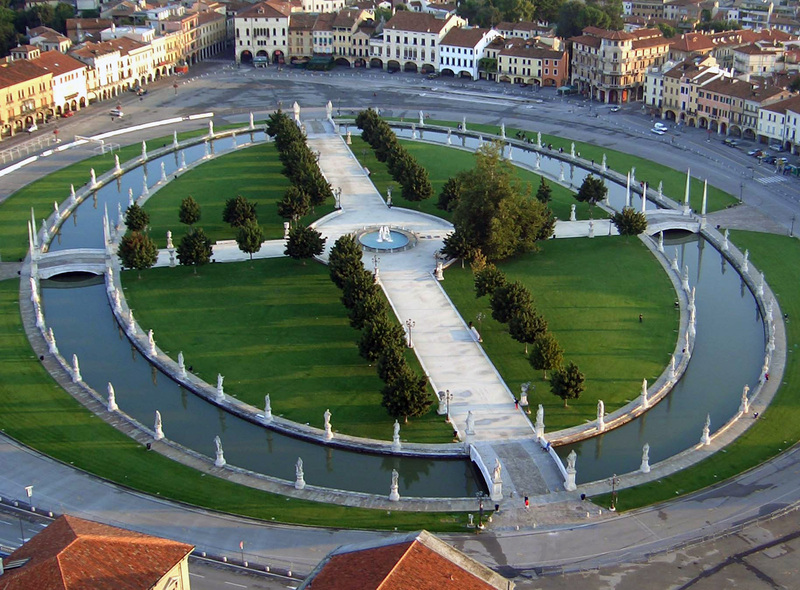 In the 18th century a local patrician named Andrea Memmo commissioned the square including an elliptical park running through the center of it connected to the main square by four bridges over a small canal surrounded by 78 statues of which Memmo is one of them. The photo above is from Wikipedia. We never got this view from the ground. There are all kinds of pleasant surprises at the end of each little winding street. But the real gem is the Scrovegni chapel, built over the ruins of an ancient Roman Arena and the Giotto frescoes that decorate the walls. 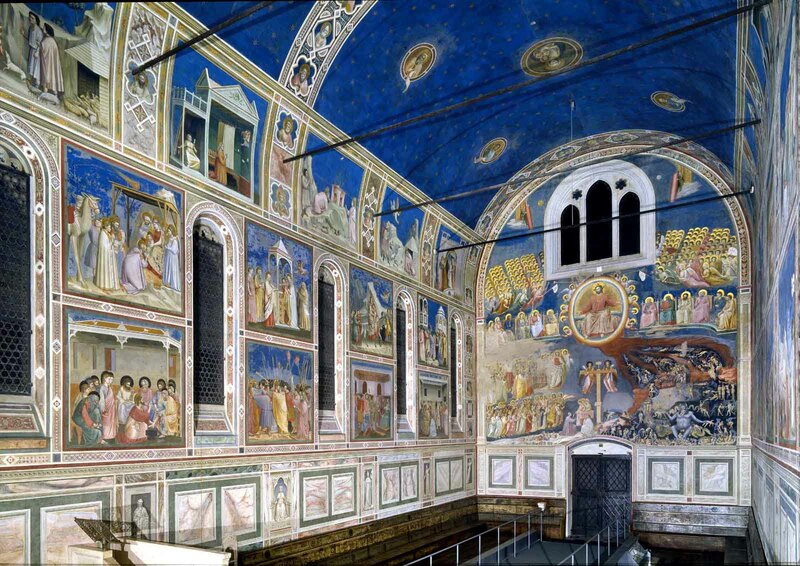 In 1303, it took Giotto two years to paint the entire chapel. It’s taken almost a hundred years to restore it. Enrico Srovegni was a banker who, with his father, charged such an ungodly sum of interest that he built this chapel to atone for his earthly sins. The restoration was just completed three years ago in 2000 and the custodians of the chapel are very concerned to keep them in great shape. It’s amazing how much pollution humans carry. Everyone must wait in an anti chamber for around 15 minutes to stabilize their molecular composition before entering. Only 25 people are allowed per entry and those lucky enough to get in are only allowed 15 minutes in the room for the viewing, which is just enough to put a smile on your face. You can always book another tour when you get out or you can buy the book of the frescoes in the bookstore for $100. Hey, they have to pay the restoration somehow. The photo above is from wikipedia. When we were there, photos were not allowed. We’re staying at the very modern and minimalist Hotel Methis along the Riviera Paleocapa. There are four floors of the hotel, each representing one of the elements. Our room on the aria (air) floor is totally white; white walls, white canopy bed, white chairs, white carpet, white TV, white floor in the white bathroom. It’s like sleeping on a cloud, especially when you flip the switch and lower the white shades over the windows. It’s a brand new hotel. I have no idea how long everything will remain white. Tourists can be pretty hard on hotel rooms, and winter is coming. Down the canal is the little Enoteca Angelo Rasi. We stopped by there last night for dinner to celebrate my birthday. Apparently I share the feast day with the festival of San Martino and the place was fully booked. Martin grew up in Patavium (modern day Padova) in the 4th century when his father was a guard in the Roman Army. When he became old enough he too became a soldier and was stationed in Ambianum (now Amiens, France). As the story goes, one day Martin was near the gate leading to the city of Ambianum when he came across a beggar, naked in the cold. Taking pity on the poor beggar, Martin removed his warm military cloak and cut it in half, giving half of it to the beggar. That night Martin had a dream where Jesus revealed to him that the beggar was actually him, Jesus Christ. I’m not quite sure how the half of the cloak returned to Martin. This part of the story is very vague. In fact the whole story is kind of vague but nonetheless, the cloak returned and proclaimed a miracle and paraded throughout the countryside. Each shrine to house the torn cloak was known as a “Capella”, the latin word for small cloak. The english word for a cloak is a cape. The French word for a Capella is a Chapel and the Chaplain is the person who takes care of the Chapel. Isn’t language grand. Martin was baptized in Caesarodorum, now Tours, France, and spent a lot of time wandering the countryside preaching the gospel and baptizing the locals. When Martin heard that the christians of Tours were coming to find him to offer him the job of Bishop of Tours, he hid in a barn but unfortunately he startled a gaggle of geese who cried out and signaled the Tours citizens of his hiding place. Once he was discovered and confronted by the people, he accepted the position. I have no idea why November 11th is the feast of St Martin, although in many places it traditionally begins a 40 days fast known as “Advent”. Padua is the only place I know of where goose is the traditional meal on the feast of St Martin. We were seated at a table in this small restaurant with 30 other people enjoying the Feast of San Martino. As the legend goes, if you eat Oca (goose) during the festival of San Martino you’ll have good fortune for the rest of the year. We ate so much Oca , I’m getting as big as an Orca. There were three kinds of goose liver (served one at a time), followed by oca risotto and finally coze di oca (thigh of goose). When they asked us if we wanted dessert, we laughed and quacked out of the restaurant back to the hotel. Even though the Feast of San Martino is a big deal here, the big church is dedicated to St Anthony, who was born in Lisbon but died in Padua in 1231. He was canonized in 1232, being the fastest sainthood on record in the Catholic Church. The Basilica of Saint Anthony was consecrated in 1232 and holds his saintly bones. His tongue is displayed in another reliquary. As the story goes, 30 years after he died, his body was exhumed and his tongue showed no signs of decomposition. One more miracle to add to the legend of St Anthony of Padua. The seven towers are unique, possible the only Basilica of it’s kind. it’s a wonderful blend of Byzantine, Gothic and Moorish/Venetian architecture. 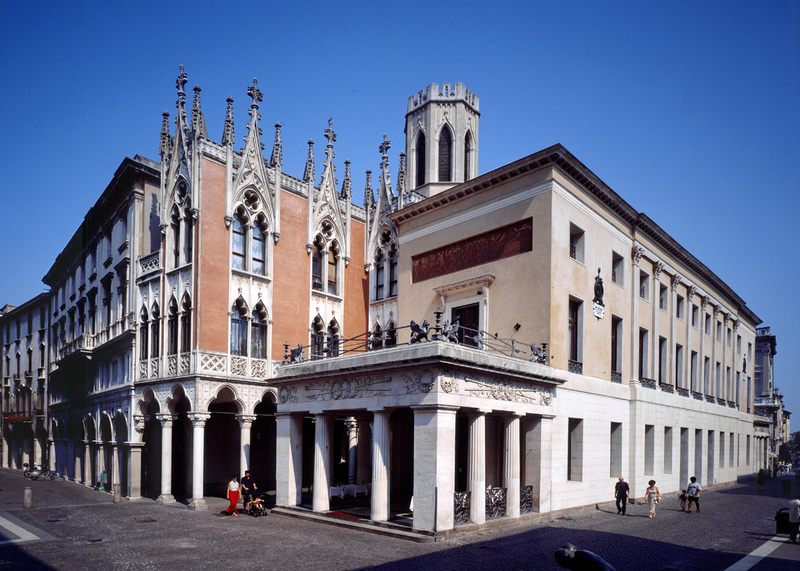 The cafe Pedrocchi in Piazza Cavour is a national (if not nationalistic) landmark in Padua. When it opened in 1831 it was reported to be the largest cafe in Europe. Stendahl reported it was the best Italian Cafe he had visited and ranked right there with Parisan cafes. It was a favorite hangout of artists and students and in 1848 it became famous as the headquarters of the Italian opposition to the Austrian-Hapsburg rule of the city. It was known as the Caffe without door because it was open day and night for 85 years since it first opened in 1831. Antonio Pedrocchi was so loved by the Padovans that when he died in 1852, his coffin was paraded throughout the city and all came out to pay their respects. The building suffered damage during the bombing of World War II and although it was repaired many times since then it has recently experienced a complete neo-classical restoration returning it to it’s original 19th century magnificence when it reopened in 1998. But aside from the history here, it’s an excellent caffe. The Cafe Pedrocchi is a delicious espresso with a mint flavored cream foam. it’s really good. We heard the food was also really good but we only stopped for coffee. By the way, Padua is very close to Vicenza, where you can see a lot the work of Andrea Palladio, father and founder of Palladian architecture. Palladio was born in Padua but her never worked here. As an architect, he successfully combine arches, portholes, cow skulls and grotesque heads all in the same building façade. It’s hard to say that about any other architect.